To Walk or Ride on your floor Scrubber Drier ? Scrubber driers are available in many different configurations and sizes, but the main difference is whether you choose to walk behind or ride on your floor machine when you are cleaning the floor. So what are the pros & cons of the different types ? 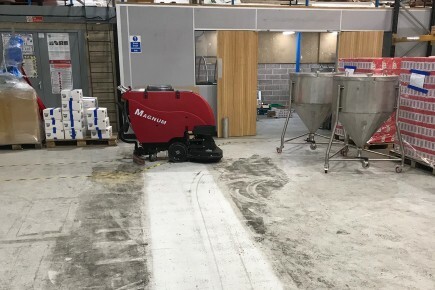 Ride-on scrubbers in general have a greater water capacity than the smaller pedestrian machines, battery packs can also be larger which gives a greater autonomy, less filling and emptying and longer run times give the operator greater productivity. 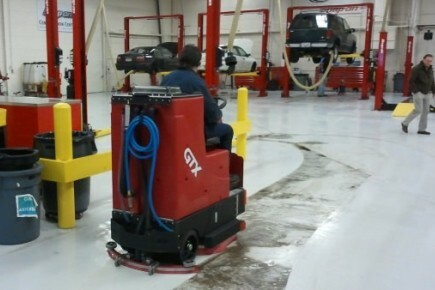 Walk-behind models can clean closer to the edge and reach areas where it is not possible to get a ride-on scrubber. Sit on machines are more suited to larger open spaces where you can make the best use of their productivity. Most manufacturers reduce the size of the scrubbing motors on their walk-behind models, generally they do not have the electronic brush pressure systems of their bigger brothers. FactoryCat & Tomcat machines are the exception to this, with fully adjustable brush pressure and large scrubbing motors. Ride-on scrubber driers are generally more expensive to purchase, with bigger battery packs, larger motors and a more costly drive motor. The ongoing running cost for a rider scrubber will also be greater as the parts and consumables are more expensive.